LoA Strategy - Meet the requirements to evolve your Mount! 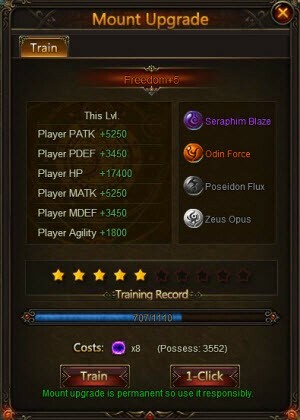 Best Browser game LoA Strategy - Meet the requirements to evolve your Mount! 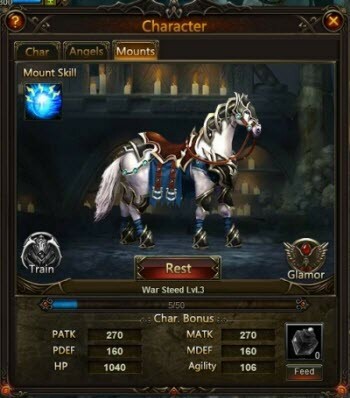 Mounts are a very important part of League of Angels, not only do they look nice and make you walk faster, they provide much needed stat buffs and skills in the heat of battle! 1. You get your first mount at Lvl. 21. 2. Mounts grant your main character and party with special stat boosts and skills. 1. If you wish to upgrade your mount, simply click the Mount button at the bottom of the screen. 2. Once you are inside the mount menu, you can upgrade your mount by clicking the Train button. 3. Each time you click the Train button, you will exchange a set amount of Soulstones for EXP. 4. When you get enough EXP, you will light a star. When you light all the stars, you will gain a training level, when you light all the starts, you will raise your training class. 5. You can also use the 1-Click button to instantly gain a level, if you have enough Soulstones. Boost your Attributes with the new League of Angels Mount Evolution system. Evolving Mounts alters their name, appearance, skills, and more! Evolving mounts will give your characters a much needed to boost in strength. In order to help protect our beloved angels, even mounts should become increasingly stronger to boost the strength of your whole battle party. Evolution allows mounts to surpass previous limits of training and change into more powerful forms. Evolved mounts will be given a new name, more skills, and more incredible appearances. Be aware that this process is irreversible! Meet the requirements to evolve your Mount! There are requirements that must be met before each evolution. Each evolution requires a certain number of evolution stones and the correct successor mount.